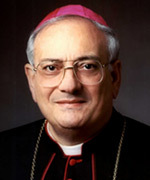 In July of 1999, Bishop DiMarzio was appointed as the Sixth Bishop of Camden, New Jersey, and served there until October 2003, when he was installed as the Seventh Bishop of Brooklyn. Bishop DiMarzio is currently chairman of the board of the Center for Migration Studies, and the Migration Policy Institute board. He is a member of the boards of CLINIC and the USCCB Migration Committees. Bishop DiMarzio is a former member of the Vatican’s Pontifical Council for the Pastoral Care of Migrants and Itinerant People. He also previously chaired the boards of the Migration Committee of the USCCB, the Catholic Legal Immigration Network, Inc. and Finance Committee of Catholic Relief Services. From 2003 to 2005, Bishop DiMarzio served as the U.S. representative to the Global Commission on International Migration, inspired by the United Nations, as our Nation’s Commissioner representative.